A couple of weeks ago I travelled to Durham to deliver a figurative weekend workshop to the very friendly and welcoming ‘Embroidery 15’ group. Many of the group had never worked figuratively before so I was pleasantly surprised by the resulting work. The workshop started with my presentation about the way different textile artists use the figurative image and by looking at my own handling collection which comprises of lots of small samples of different techniques that can be used for figurative textile work. 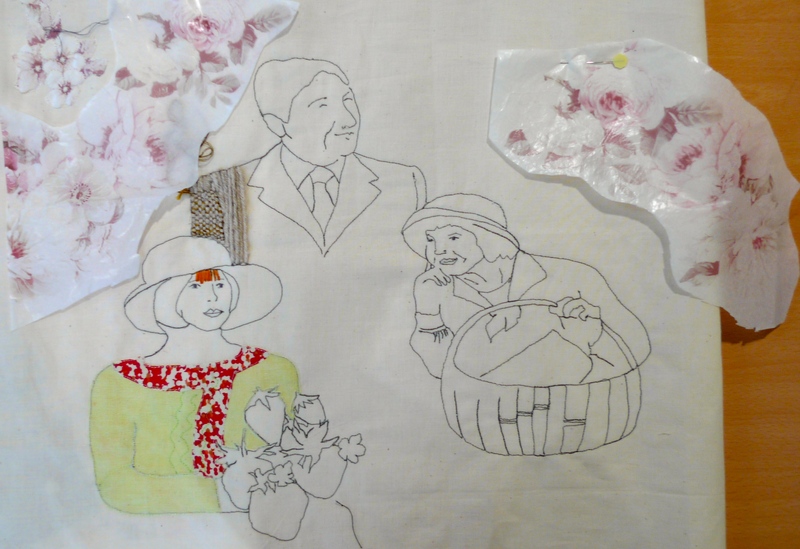 We continued by experimenting with composition in collage and finally started to work with fabric and thread, mixing hand and machine stitch with appliqué and paint. Here is a selection of the student’s work that was produced over the weekend. This entry was posted in Embroidery, Sewing and Stitching, Textile Art, workshops and tagged Durham, embroidery, embroidery 15, hand embroidery, Machine stitch, sue stone, textile artist, textiles, workshops on April 11, 2014 by womanwithafish.